The image gallery is where the user can browse the captured images that are stored on camera SD card or downloaded locally to device that is running qDslrDashboard. Close button – pressing this button will close the image gallery screen. Image thumbs – image thumbs with the image name that are located on camera SD card or locally on the device that is running qDslrDashboard. Single press – if the image gallery is in ‘browse mode’ the application will display the pressed thumb in image viewer. 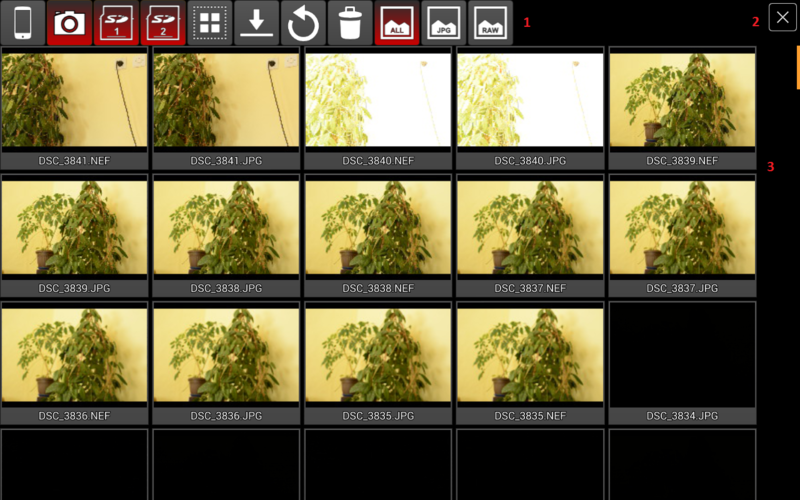 If the image is located on the camera SD card it will first download the image (check the Image gallery buttons page). Long press – If the image gallery is not in ‘selection mode’ it will turn on ‘selection mode’ and select the pressed image thumb (check the Image gallery buttons page).